Functional, comfortable, and trim are words you could use to describe a solid, scrambler built motorbike. Among the various styles of bikes that Boxer Metal builds, it’s clear that they know what they’re doing when it comes to producing a build that is as fun to ride as it is to look at. The last time we saw Chris and Rebecca, we pointed our lens at their extravagant Twin Turbo R100 creation. For the next story, we decided to show what they’re capable of building for their customers. 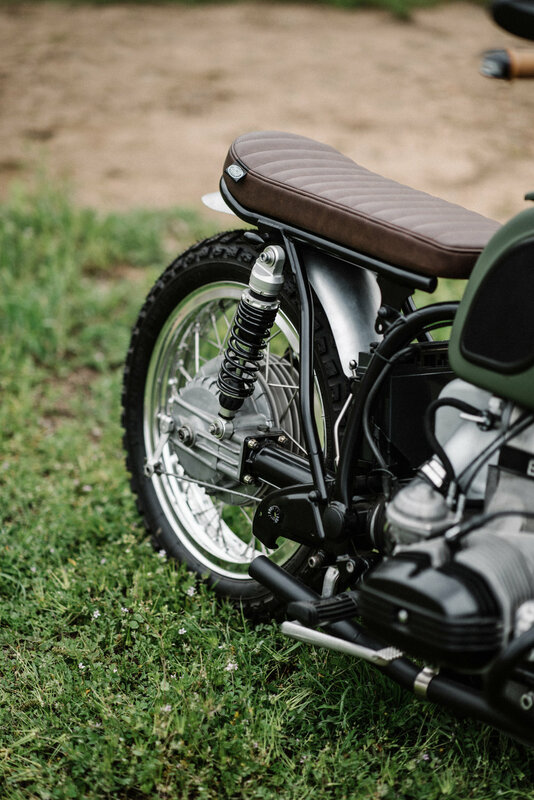 What we see here is a 1983 BMW R80 made over in a mock military, scrambler fashion. The base of the bike was found when a friend of the shop tipped that there was a “secret stash” of old BMW bikes and parts in the area. Not being the kind of people to pass on a rumor like that, Chris and Rebecca did some research and actually found this treasure trove of parts. In it was this R80, another complete BMW, and several truck loads (literally) of parts, all over the spectrum from the early 70s through new R1150/R1200s. The Urban Scrambler is meant to take the rider almost anywhere, dirt and pavement alike. Typically, Boxer Metal has quite the free rein when it comes to their customer projects. Enthusiasts trust the husband and wife team and they come specifically for their unique vision. No bike is the same as the next, and that’s one of the beauties of the specialty shop. This bike had just a couple of simple requirements: it had to have a green tank, no chrome, and be appropriately sized for a shorter rider. Chris brainstormed what this bike could potentially look like. Several stick figure drawings later, he began to wonder what a military style BMW bike would have looked like in the 1980s. Drawing from that inspiration, he tore into the R80 and got to work. “The bike didn’t need a lot of power or huge brakes, so we kept it very simple. We designed an exhaust system that didn’t take from torque or horsepower,” Chris explained. Much like the rest of Boxer Metal’s builds, no bolt was left untouched in the process of creating the Urban Scrambler. The frame was sent to powder coat, and every piece of hardware was either replaced or re-plated. The engine was gone through and all components were refreshed or replaced in thorough fashion. One of the goals in keeping the bike simple was to keep its maintenance demand low. The shop then sourced a BMW police bike tank from the mid 70s, and they outsourced the seat, rear frame, and fender to Down & Out Motorcycles in the UK. To further aid in keeping the bike on the smaller side, the front forks were rebuilt and coupled with short YSS shocks in the rear, which lowered the bike almost two inches, front and back. The Brembo calipers in front required modification to the 18” Borroni wheels, which were swapped in to replace the mag wheels. The rest of the bike—handlebar controls and switches, headlight, and wiring harness—are stock. The only electric accessories added to the bike are the Acewell 2853 instrument and the Rizoma bar end turn signals and rear turn signal / tail lights. With any project, you have to expect at least some resistance and some unplanned challenges. The unexpected part of this build came from a delay in delivery of the bike. “The customer said that he couldn’t pick up the bike for another four months because his young daughter was ill and in need of special care,” Rebecca explained. This news was a personal and harsh reality, as Chris and Rebecca have two children of their own. At that point, the bike was about 80% complete, but the couple switched gears and tore it back down. At no extra cost to the customer, the shop went back and modified, replaced, and upgraded components that weren’t even in the original budget. Everything in this second round of work further improved the safety and comfortability of the bike. “Sometimes you need to take that extra step,” Chris said. Ultimately, the hard work and planning for this unique bike paid off, and Chris and Rebecca found it rewarding to build something so simple. It’s arguably easier to build something more complex than minimal, but it clearly wasn’t an issue for Boxer Metal. One of their favorite parts about the bike is the fact that it’s on the shorter side, as it harkens to their own personal experience of being “vertically challenged,” as Rebecca puts it. We are always excited to see what Boxer Metal has in store. If you’d like to follow along with them (if you somehow don’t do so already! ), you can find their info below. A huge thank you to Chris and Rebecca for their time and talent, and we look forward to what’s next!